I graduated from NC State in 2015 with a B.S. 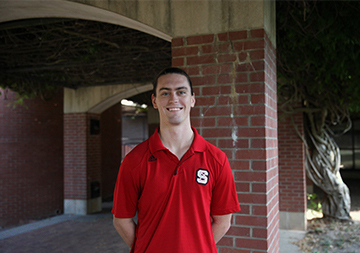 in Textile Engineering from N.C. State with a concentration in product engineering. During my time as an undergraduate, I worked for the NEXT research group as an undergraduate research assistant on several different projects. These projects were focused on product development such as 3D printing nanoparticle cotton or a shooting sleeve that can track arm motion. For the two years following graduation I worked in Madrid, Spain teaching English to primary school students and becoming fluent in Spanish. Now I am back at NC State as a master’s student in Textile Engineering again focused on product development. Energy storage integration, electronic textiles, wearable technology. I am currently working on incorporating batteries into garments to power various wearable technologies. This project considers possible use cases for battery technologies and developing the packaging strategies to meet the criteria for a wearable battery. Several applications were considered but ultimately a garment that illuminates at the push of a button was selected. This garment has been shown to be fully launderable with all of the technology incorporated into the garment while maintaining functionality and rechargeability. Outside of the NEXT group, I’m working on a project to reduce global maternal and infant mortality for UN Sustainable Development Goal 3. We aim to install a data visualization room into every country to maximize the potential for life changing advancements by utilizing our knowledge of the Six Sigma methodology. Check out our video on Vimeo for more information! B.S. from N. C. State University in Textile Engineering.